Madisyn Grace joined us. It seems as though she has always been part of our lives. I can't imagine what we did as a young married couple with no children. (Of course, now one child seems like a cinch ;) .) Kent and I were 21 when she was born. We were discussing the other day some of the things we did because older people told us we would "pass" her off. We couldn't imagine doing such a thing after we wanted a baby and waited 9 months for her. She was very wanted (as were all our babies). We were a bit extreme in our protectiveness. I was so thrilled for her to finally arrive. She was/is perfect in every way. 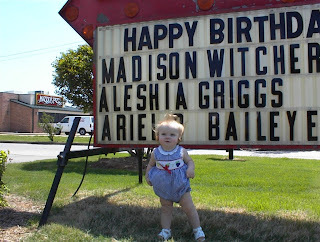 Her 1st birthday (with her name on the Sonic sign - I think this is the only time we have gotten a picture.) Just a few shorts weeks before her first birthday we found out that Ty would be joining us in the fall. Madisyn has always been a talker - even at age 2. The saved name for this picture is Madisyn talking to Daddy. I'm sure she was really talking to him. I can't imagine putting Griffin on the phone now at almost three and expecting anyone to understand a conversation. Madisyn got the gift of gab. When she was three we starting going to the zoo. The 3rd birthday was the year of the pig cake. She really did want a pig for a cake. Her 4th birthday. I think this is the only party we had that wasn't at home. In my defense, I was very pregnant with Griffin and we were desperately trying to move. Number 5 . . . This is the only cake I didn't make. Papaw bought a party package at the Lion's club auction so we used it for Madisyn's birthday. 6th birthday and another trip to the zoo. This birthday I was very pregnant with Ben. Notice a trend LOL. and she's seven. (Where's the bawling eyes out emotion?) Wow! What a year this has been. We're homeschooling for the 2nd year and she can read - I mean really read. She excels in math. Madisyn is such a big help with her brothers and mothers them whether they like it or not. She has learned how to operate the washer and dryer (oh so helpful) and even make the bed (including putting new sheets on!). Just a few days before her birthday she told her Daddy that she wanted three things for her birthday. #1 a baby sister (how sweet is that?!?! ), #2 a pony (we brought papaw's horse over) and #3 a picture of the whole family for her dresser - we're working on that one. No I want a new doll, or I need more clothes. Just very unselfish (other that the horse) items. I have days that I want to pull my hair out but I'm so glad God made me her Mommy. I'm a very blessed woman.